Public education and outreach is a proactive approach in which the police department engages with the local community. 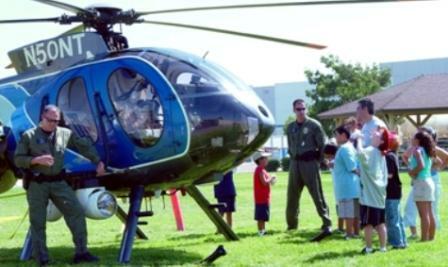 In the above photo the Ontario PD helicopter officers participate in the Ontario safety fair. Maintaining safety in Ontario’s residential neighborhoods and commercial and industrial districts contributes to the City’s prosperity. Ontario achieves this through a proactive approach that goes beyond crime suppression to include prevention strategies that engage the community. Neighborhoods and commercial and industrial districts that are kept safe through a multi-faceted approach of prevention, suppression, community involvement and a system of continuous monitoring. Police Unit Response. We respond to calls for service in a timely manner. Community Oriented Problem Solving (C.O.P.S.). We support and maintain the mission of COPS to identify and resolve community problems. Prevention Services . We provide crime prevention programs targeted to youth, parents, seniors, businesses, and neighborhoods. Crime Prevention through Environmental Design (CPTED). We require new development to incorporate CPTED in the design of streetscapes, sites, open spaces and buildings. Interdepartmental Coordination . We utilize all City departments to help reduce crime and promote public safety. Partnerships. We partner with other local, state and federal law enforcement agencies and private security providers to enhance law enforcement service to Ontario. Resource Allocation. We analyze crime data to evaluate the effectiveness of crime prevention and reduction strategies and allocate resources accordingly.